FILE - A Chinese national flag and two flags bearing the name of ZTE fly outside the ZTE R&D building in Shenzhen, China, April 27, 2016. President Donald Trump says the United States has "little to give" in contentious trade talks with China, and Beijing has a lot to give, because he says the United States for years has been losing trade battles with China. Wednesday, he defended his call to rescue China's giant technology company ZTE, which the U.S. Commerce Department last month barred from buying American-made components for its consumer products for seven years after it was caught violating U.S. trade bans with Iran and North Korea. ZTE said with the cut in U.S. parts it had ceased "major operating activities." "Nothing has happened with ZTE except as it pertains to the larger trade deal," Trump said on Twitter. His assessment came days after he said "too many jobs" were being lost in China because of ZTE's difficulties and that he had "instructed" the Commerce agency to "get it done!" to help ZTE "get back into business, fast." 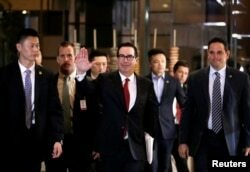 FILE - U.S. Treasury Secretary Steven Mnuchin, a member of the U.S. trade delegation to China, waves to the media as he returns to a hotel in Beijing, China, May 3, 2018. The U.S. and China, the world's two biggest economies, are in the midst of contentious trade talks this week in Washington, after Trump threatened to impose higher tariffs on $150 billion worth of Chinese exports and Beijing responded in kind to say it would impose higher levies on American products. Earlier talks in Bejing proved fruitless. "Our country has been losing hundreds of billions of dollars a year with China," Trump said of last year's $375 billion annual U.S. trade deficit with China. Trump's call to help ZTE has mystified some U.S. lawmakers, who say that use of the Chinese company's products presents a national security risk for the U.S. The House of Representatives Intelligence Committee concluded in 2012 that ZTE "cannot be trusted to be free of foreign state influence and thus [poses] a security threat to the United States and to our systems." Senator Marco Rubio, who lost the 2016 Republican presidential nomination to Trump, is attacking the U.S. leader's attempt to help ZTE as misguided. "It's not a trade issue," Rubio told VOA. "ZTE's been sanctioned for helping Iran and North Korea evade sanctions. So how are we going to be able to enforce the cancellation of the Iran [nuclear] deal if we're not going to be enforcing it on companies in powerful countries that are helping Iran evade sanctions already?" "That's a law enforcement function that really shouldn't have anything to do with trade," Rubio said, "Chinese telecom companies are agents of the Chinese government. They don't just steal national security secrets, they steal commercial secrets. Like they will use a ZTE phone to spy on an American company and steal their intellectual property."